If we look at a fresh-water lake during windstorms, we do not see deep piles of long-lasting foam along its shores like we do on Great Salt Lake, which is very salty. From this observation we might conclude that the formation of foam must have something to do with fresh versus salty water. In reality, the formation of foam is dependent on a fluid property called surface tension. Fresh water has a high surface tension, somewhat like a strong, thin, invisible film on its surface. It is this property that allows insects like water skaters to walk on the water, or for a needle to be supported if it is carefully placed flat on the water’s surface. When crashing waves form bubbles in fresh-water lakes, the bubbles rise quickly and immediately pop when they reach the surface. This happens because the high surface tension of fresh water prevents the bubble’s surface from stretching once it reaches the surface of the water. The lake’s high salt content does not appear to be the reason for the creation of foam. When salt is added to fresh water, experiments show that the surface tension of the resulting solution becomes higher than that of fresh water, and will further inhibit the formation of stable bubbles. This being the case, one wonders how foam forms at all on Great Salt Lake. The formation of stable foam on Great Salt Lake is likely caused by the presence of naturally occurring surfactants in the lake water. Surfactants are organic compounds, similar to soap, that lower the surface tension of the water. 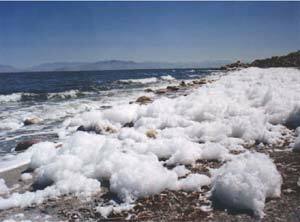 When crashing waves create bubbles in Great Salt Lake water, the bubbles rise to the surface but do not disappear by popping because the surfactants in the water allow the bubble’s surface to stretch once it reaches the lake’s surface. The bubble’s surface can remain stretched for long periods of time, and as millions of bubbles form, they build up into deep piles of long-lasting foam. The largest source of surfactants in Great Salt Lake is the abundant phytoplankton that lives in the water. In Great Salt Lake, the most common type of phytoplankton is Dunaliella viridis, a salt-loving, green-pigmented variety of algae. These algae exude surfactants as part of their natural metabolic process. The surfactants are also released as the algae die and decay. Because the surfactants are part of the natural processes that occur in the lake and are not related to human activity, they are not considered pollutants in the lake.